← 82 Tradition of men vs. the Word of God. 83 WHAT IF WE FOUND THE ORIGINAL NEW TESTAMENT BUT DID NOT KNOW IT? I post this most interesting article by Dan Wallace that he originally posted on the blog “Parchment and Pen” on 13 September 2007. In it he describes inter alia the criteria paleographers use to date a manuscript. WHAT IF WE FOUND THE ORIGINAL NEW TESTAMENT BUT DID NOT KNOW IT? Scholars today often note that the original New Testament disappeared long ago. Although late in the second century, Tertullian speaks confidently of the originals still existing, his reliability has been discredited. Even if he were right, that would hardly mean that the original documents still exist today. But what if the originals were discovered? Would scholars even know it? After all, there would be no statements like, “This is the actual original letter of Paul to the Romans. Get your grubby mitts off it!” So, how would we know? As much as I would love to have the original documents still with us, it is doubtful in the extreme that they’re still in one piece. Extreme as in me winning the Texas lottery next week without the benefit of buying a lottery ticket. (Those of you who think you have won some Internet lottery can now excuse yourself from this discussion since you’re way too gullible.) But let’s assume, for sake of argument, that they still could exist. If so, how would we know? There would be three or four signs that we should look for. First, we would not see an entire New Testament. Instead, we would find single books only. If someone claimed that a particular manuscript was the autograph, but it contained the four Gospels or a couple of Paul’s letters, that would immediately discount it. Each book of the New Testament was sent to a particular audience for a particular occasion. Paul didn’t sit down and say, “Let me write letters to the Romans and the Corinthians and just bundle them together as one book. I’ll let those guys figure out which one goes to which church.” No, the books of the New Testament were ad hoc documents. So, if a manuscript showed evidence of having had more than one book within its covers (even if it currently had only one book), it would not be the original. Second, we would expect the originals to be written on rolls or scrolls, rather than on a codex. The codex form of book (binding on the left side in a rectangular shape, pages that turn; in other words, what modern books look like) was invented, as far as we know, shortly before AD 100. But the only New Testament book that comes close to that date is Revelation. And it speaks about a “book” on more than one occasion. The seven-sealed book mentioned in Revelation 5.1 is a scroll (even though the KJV and ASV translate this as “book” most modern translations render it “scroll”). To seal a book seven times so that you have to break the seals in sequence means that the book must be a scroll. As you unroll the scroll, the wax seal stops you from reading further until you break it. You roll further along, and another seal stops your progress. But a seven-sealed codex would seem to be one that could be opened at any section rather than sequentially (Rev 6.3, 5, etc. speak of “the second seal,” “the third seal,” etc.). In other words, the most natural way to read the text is to see this as speaking of a scroll, rather than a codex because the seals appear to be broken in sequence. Third, paleographically the manuscript would have to be dated to the first century. The science of paleography principally uses handwriting analysis to date manuscripts. Some manuscripts give their dates of writing, which then become sort of a template for how handwriting at that time in history was done. Although this may seem completely subjective, it isn’t. Consider the Declaration of Independence or the Constitution. Anyone who has seen these documents knows that they were not produced in the twentieth century. Why? Because no one wrote that way in the twentieth century. They belong to an earlier era. With biblical manuscripts there are all sorts of clues about the date of a manuscript. For example, if the introductory letter to a paragraph is oversized and “out dented,” the manuscript is typically not considered to be any earlier than the fifth century (since that’s when such a motif became popular). If a manuscript has accents, it’s not original since accents weren’t used on the biblical manuscripts for several centuries. There are letter combinations known as ligatures that help to locate a manuscript by date. A ligature is a combination of two or more letters into a single form. We have or I should say had them in English, too. In the word, archaeology, older English works will combine the “a” and “e” into a new form, a ligature. And normally you can date such printed books to no later than the early to mid-twentieth century because of this ligature. With Greek manuscripts, there are all sorts of ligatures, as well as several other clues, as to when a document was written. Fourth, if the manuscript is a letter by Paul, we should expect to see handwriting by two different people. The second hand would be larger and occupy only a verse or two, toward the end of the document. Paul almost always hired a secretary or amanuensis to write his letters by dictation. But he also signed off on the letter by adding a note of authentication at the end. Note 2 Thessalonians 3.17: “I, Paul, write this greeting with my own hand, which is how I write in every letter.” Paul is here declaring that when he takes the pen from the amanuensis and signs the letter, he is putting his stamp of authenticity on it. This must imply that the letter also was read by Paul carefully before it was dispatched (otherwise the note of authenticity loses much of its force). This is also probably the meaning of Galatians 6.11: “See what big letters I make as I write to you with my own hand!” Scribes would be trained to write in a petite hand, but the authors would authenticate their documents with an obviously less trained and larger hand. These are the basic things we would expect to see if we want to claim that an original New Testament document had been found. How do our current manuscripts stack up? First, although some of them are indeed only fragments of individual books, there are very, very few manuscripts of the New Testament that seem to have been originally just one book. If we isolate those, however, they don’t measure up to the other tests. Second, all of our manuscripts, except for three or four, were originally written on a codex. And the three or four that are on a scroll were written on the backside of some other document, usually a literary document (such as Homer’s Iliad). In other words, the scroll was intended for something other than the New Testament. 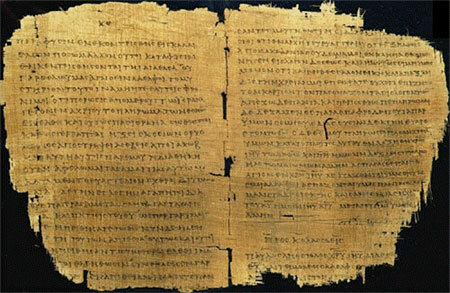 A Christian scribe simply used what was at hand to copy out a portion of the New Testament. Scrolls were normally written only on one side (note again Rev 5.1, where the unusual feature of the scroll is that it was written on both sides), while codices were written on both sides. Thus, already we have eliminated all contenders without having to go further. But third, there is only one manuscript that could possibly qualify as a first-century document. 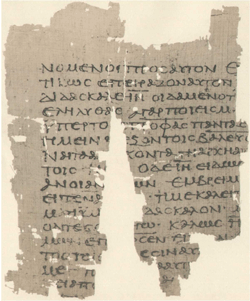 Known as papyrus 52 or P52, it is a small fragment from John’s Gospel containing John 18.31-33 on one side and John 18.37-38 on the other. The fact that it is written on both sides and that the text on the second side is very close to the text on the first side (four verses away) tells us that this manuscript was originally a codex. Adolf Deissmann dated this manuscript to the 90s AD, while most paleographers have dated it to c. AD 100-150. Thus, even if John was written in the 90s, this would not be the original document because it was written on a codex. If John was written in the 60s, as a growing number of New Testament scholars think, then P52 could not possibly be the original. Fourth, I am not aware of any New Testament manuscripts in which the handwriting changes near the end of the manuscript only, is larger, and includes just the relevant verses that would suggest that the author wrote that portion. Hands do change in manuscripts, but when they do they almost always continue with the new hand for a long way. With this evidence, it seems that it is quite safe to say that the original manuscripts of the New Testament have not been discovered. One question to ask, though, is why? Why didn’t God preserve the originals? Why are all the copies imperfect? Another question to ask is, if a manuscript met all of the above-mentioned criteria, could we then say that it was the original text? These four criteria reveal that absolutely no original New Testament manuscripts have been discovered. So, let’s do a little speculating. What if some manuscripts were found that did fit all of these criteria? Should we regard them as authentic, as the long-lost originals of the books of the New Testament? Not necessarily. If such a manuscript were discovered ”a single book, written on a scroll, paleographically dated to the first century, with a change in handwriting toward the end of the book” it could possibly be a very early copy of a New Testament book. The strongest argument for authenticity would be the change in handwriting, yet even here some scribe could emulate the apostle’s style out of respect or to show how carefully the original was copied. I would probably want to see two or perhaps even three or four other evidences of authenticity. First, the manuscript would almost surely have to be written on papyrus rather than on parchment. Although parchment manuscripts existed prior to the New Testament, they didn’t become the standard until the third or fourth century AD. 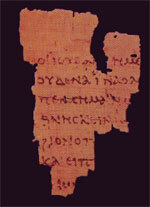 All second-century New Testament manuscripts are on papyrus, for example, as are most third- and fourth-century manuscripts. Second, I might expect to see scribal mistakes in the manuscript, but also see corrections. This would especially be more likely in the longer letters. We know of no New Testament manuscripts of any real length that have no mistakes in them. If the original of Romans were discovered, for example, I would expect to see some letter crossed out in Rom 5.1 and another put in its place. I am hoping that the crossed out letter would be an omega and the one written in its place an omicron, but that story’s for another day. I might expect to see a correction in 1 Thess 2.7 and 1 Cor 14.34-35, too. Again, the details of these points are for another time. But one thing I should mention here: if the original documents were inerrant, this does not mean that they weren’t messy! Paul could have easily corrected his secretary’s work here and there before the letter was dispatched. In the places mentioned above, I expect that it exactly what happened. Third, what I might expect is the lack of nomina sacra. That is, special contractions of various “sacred” names that are found universally in the New Testament manuscripts. Names such as God, Jesus, Christ, Father, mother, David, son, man, Spirit, etc. are usually contracted with a horizontal bar over the top in NT manuscripts. The earliest manuscripts that have these words contract them. Several theories have been presented as to why the early Christians used nomina sacra, but no theory has won a consensus among scholars. However, one thing seems certain: from a very early period, Christian scribes throughout the Roman empire used them. Since this is the case, it presupposes that the early manuscripts produced by these scribes had a common ancestor, at least, a common understanding among the scribes. We don’t have a word about the nomina sacra in the ancient Christian literature that would tell us when or why they were used. But since the manuscripts from geographically widespread regions and from early dates have them, some sort of agreement among scribes must have been reached, probably as early as the beginning of the second century. This raises a question: Who invented the nomina sacra and when did he do so? One distinct possibility seems to be that one of the original authors of the New Testament began using them, and the scribes picked up on this and spread the habit across the board. For this reason, we would not necessarily say that an original manuscript would be without the nomina sacra; on the other hand, if a manuscript lacked them this would not necessarily argue for it being an original , although it would argue for it being very, very early. Fourth, what I might expect to see is cursive script. Cursive handwriting is a running hand, with the letters connected, rather than a block hand. In other words, cursive is different from printing by hand. In the ancient Greek world, the difference is also maintained. However, for New Testament manuscripts, the earliest cursive or minuscule manuscript known to exist is from the ninth century. All of the manuscripts from the first eight centuries are in uncials or majuscules or capital letters. So, why would I almost expect to see the original as a cursive manuscript? Because the cursive script was not invented in the ninth century, but had existed long before the original New Testament was written. Let me explain. The kind of script used then is somewhat analogous to today. When you fill out that nasty little form for the government every April, you are asked to “PLEASE PRINT.” The reason is that the IRS wants your handwriting to be crystal clear. You comply because, well, they’re the IRS. But if you write a note to your spouse, do you print? Probably not. Your spouse can understand your handwriting. Or when a doctor fills out a prescription, can anyone read the handwriting? Yet that same physician will print legibly for the IRS. What I’m saying is that in different contexts, the very same person may use different styles of handwriting, cursive or printing. Often it has to do with a matter of “rank.” The doctor is acting authoritatively in his capacity as a physician when he writes the prescription. If you are writing to an employee, you might be less careful than if you were writing to an employer. Of course, nowadays the sloppiness factor is more related to spelling in an email than to handwriting of any sort! But the principle is the same. And it works for ancient papyri, too. Many letters from a citizen to the government used uncial script. But those written by superiors or relatives frequently used cursive. I do not know how frequent either hand is, but I have at least seen this sort of pattern on numerous occasions. That brings us back to the New Testament. What sort of books would have been originally written in capital letters and what sort would have been written in cursive? I’ll let you exercise your own imagination on that front. A second question is, Why are all the New Testament manuscripts from the first eight centuries written in uncial script rather than cursive? This entry was posted in Ancient Translations, Internal Criteria, Papyri and tagged Ancient Bible Manuscripts, Criteria to evaluate Bible differences, KJV/NIV Controversy. Bookmark the permalink.